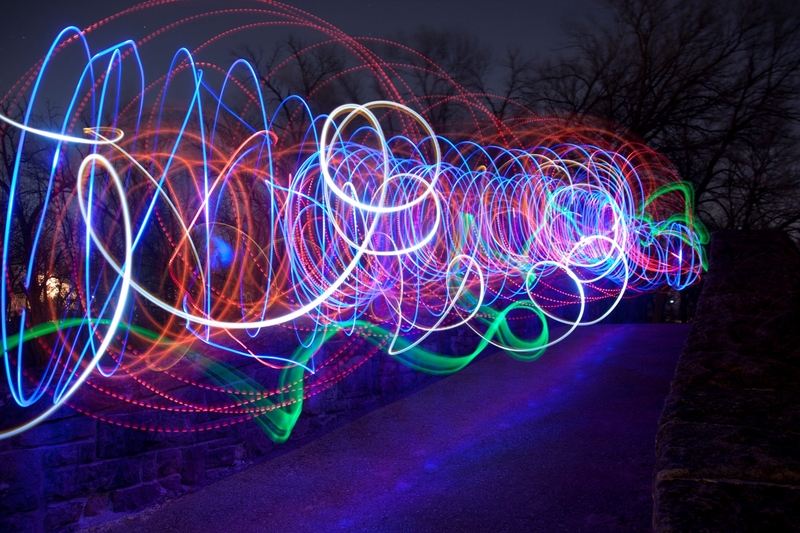 Long exposure photography provides a lot of opportunities to play with light, including drawing patterns, designs, or even words. 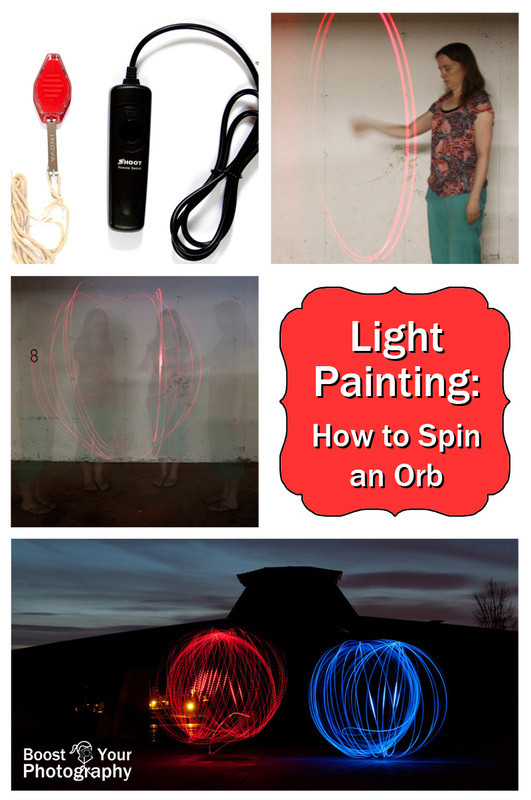 One of the easiest and most popular ways to paint with light is to make a three-dimensional orb. This post will explain what you need, what settings to use, and the technique behind painting your own orbs. It is also helpful to have both a sturdy tripod and a camera shutter remote. See this previous article about how to maximize your tripod for additional tips and information. If you do not have a tripod, you can also find a steady surface to sit your camera on, like a table or picnic table. If you do not have a camera shutter remote, you can use the self-timer function on your camera. One nice feature with many camera shutter remotes, however, is the ability to lock the shutter open and take continuous shots, allowing you to take several pictures without having to go back and re-set the camera. 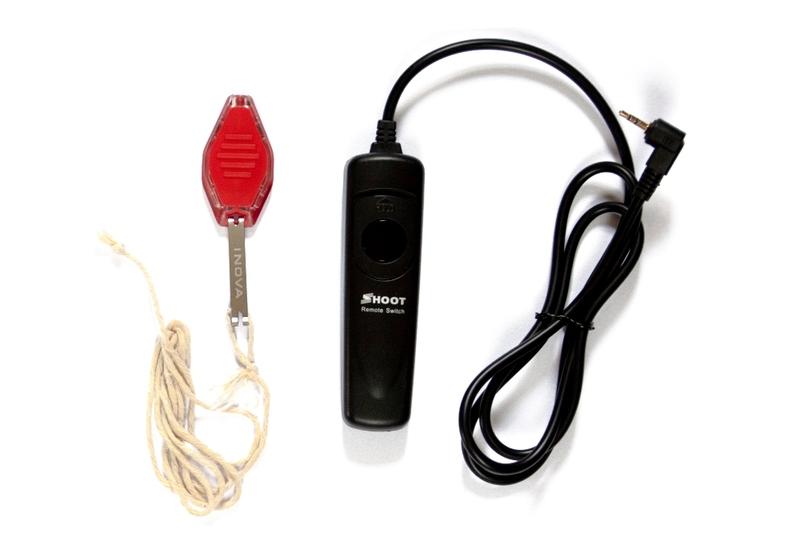 Corded camera remotes cost around $5-10 USD on Amazon. I have had great success with the INOVA brand of LED lights. Any kind of camera is capable of taking successful orb shots, as long as you have an option for setting the shutter speed. For the best results, you want a long shutter speed. I have found that thirty seconds is enough time to make at least one complete rotation for an orb. You also want to keep your ISO as low as possible to avoid unnecessary noise, so I leave mine at 100. The main variable in your camera settings will be your aperture, which is highly dependent on your ambient lighting and what kind of detail you want from your surroundings. You may have to take several different shots with varying aperture to decide what works best for that given situation. In the image above, I wanted to show the orb in context, so I settled on an aperture of f/9 and a thirty-second shutter speed. A wider aperture like f/1.8 would have let in far more light from the background and blown out the natural night feel of the shot, while a narrower aperture like f/22 would have eliminated much of the detail in the background, leaving mainly the orb without context. Particularly at this time of night, the hour after sunset known as the ‘blue hour,’ the ambient light with be constantly changing, and you will likely need to keep adjusting your aperture to get the shots that you want with a long enough shutter speed. The technique for spinning a successful orb is fairly straight-forward, and with just a little practice, you should have no problem turning out lovely, even orbs. Larger orbs often have a great impact, which is why I suggested tying the string so that the light nearly touches the ground, but you can vary the length to achieve any size orb. To spin an orb, you will stand with your arm straight out in front of you, parallel to the ground. Hold the end of the string so that the LED is close to the ground. Then, you will swing it around in a circle, moving just your hand and wrist. Your arm should stay stable. The circle inscribed by the light should by parallel to your body (perpendicular to your arm). If you stood still and did that for an entire shot, you would have a successful, but two-dimensional, circle. Here you can see how I am standing and swinging the light in a circle. The lowest point at the bottom of this circle is where you have to pay attention. I have placed a quarter on the ground at that exact point, to emphasize it for the picture and to use as a reference. Once you are familiar with the idea, you can usually remember where you are swinging. The trick for turning that circle into a three-dimensional orb is moving while you are spinning. You, however, are the one doing the moving, while the rotating light source is staying still, relative to its axis. So, each time you swing the light toward the ground, you want it to pass over that point at its lowest point in the swing (here, over the quarter). This photograph gives you the general idea. 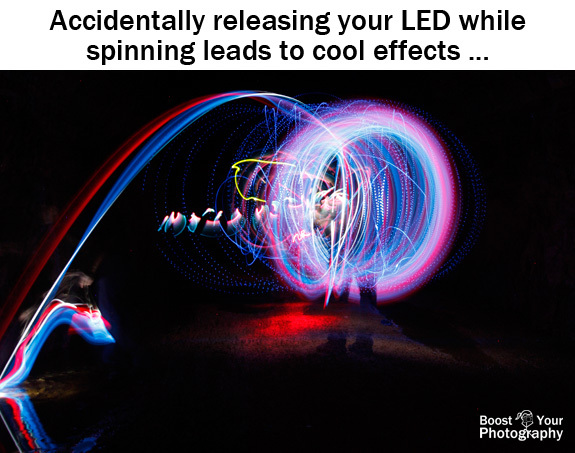 You can see that I am the one moving, side-stepping slowing around in a circle, while still spinning the light so that it passes over the same point on the ground. 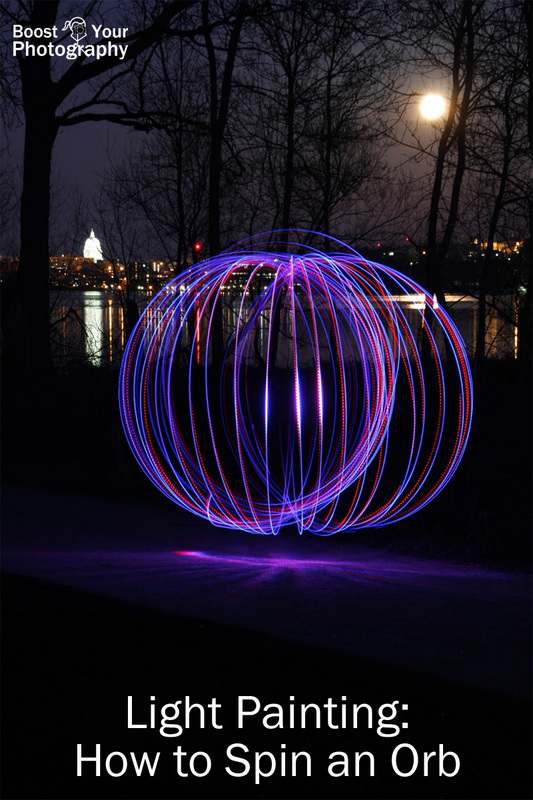 When actually making an orb, you want to be constantly moving, swinging, and stepping. This, along with wearing darker clothing (and doing this at night rather than in a lit garage), are what will make you disappear entirely from the picture, leaving just the orb behind. Once you’ve mastered the basic technique, there are endless other variations; you are not limited to orbs. Another interesting shape is a spiral, which can be made parallel to the camera (making a long, wide spiral) or by walking closer or further from the camera (making more of a funnel/vortex type shape) or by swinging it around your body for a Slinky shape. You can free-draw other shapes or even spell out words. I find cursive easier than print, because you don’t have to turn on/off the light to break up your lines. You will need to either spell mirror-imaged or flip the image in post-processing to read it. Consider recruiting some friends and spin several orbs at once, or let each person make their own designs. 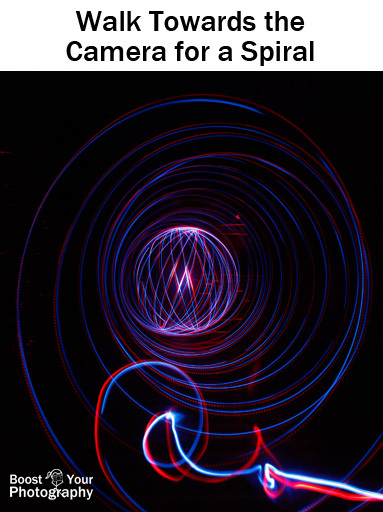 Many different lights can be used for light painting, and the image above includes keychain LEDs, disposable glow sticks, and even a cell phone (white). Even your mistakes can make for interesting images! 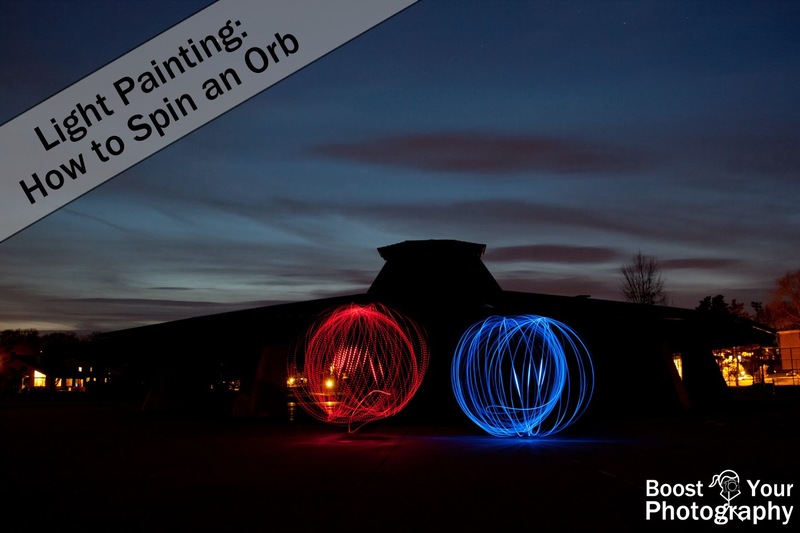 The setting is what really makes an orb or light painting shot memorable. Try including a well-known landmark, particularly one that is lit interestingly at night. 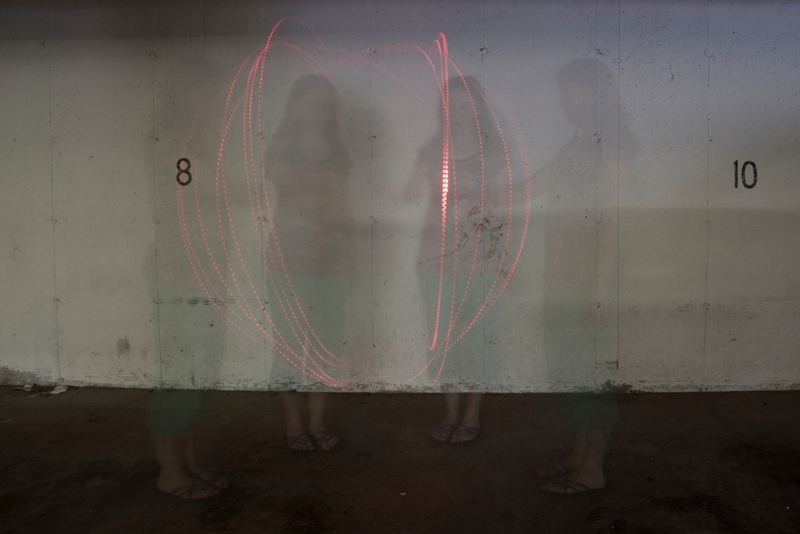 Ambient locations such as abandoned buildings, tunnels, or caves can also provide unusual results. Once you start looking, you’ll likely find many interesting locations around!